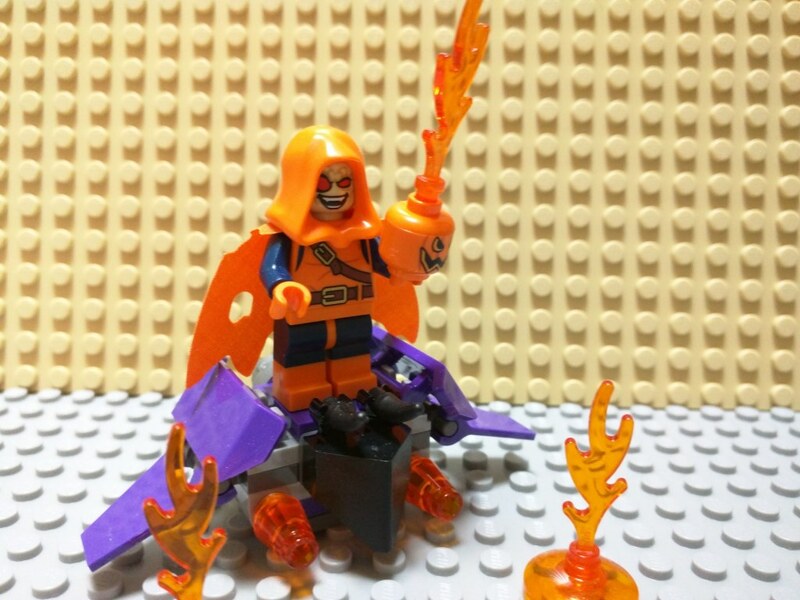 So, I want to talk about the set number 76058 called Ghost Rider Team-Up. As you may already know, it’s a Marvel Super Heroes set, more precisely a Spider-man one. I got interested in it for two reasons, the “Marvel Team-up” concept which was a series I was fond of as a kid. If you have never read it, in the 70’s 80’s there was a Marvel Team-up series, every episode was a one-shot where Spider-man would work with another Marvel super hero, sometimes big, sometimes obscure, for the duration of one episode. I find that this sets transcribes perfectly those one-shots. 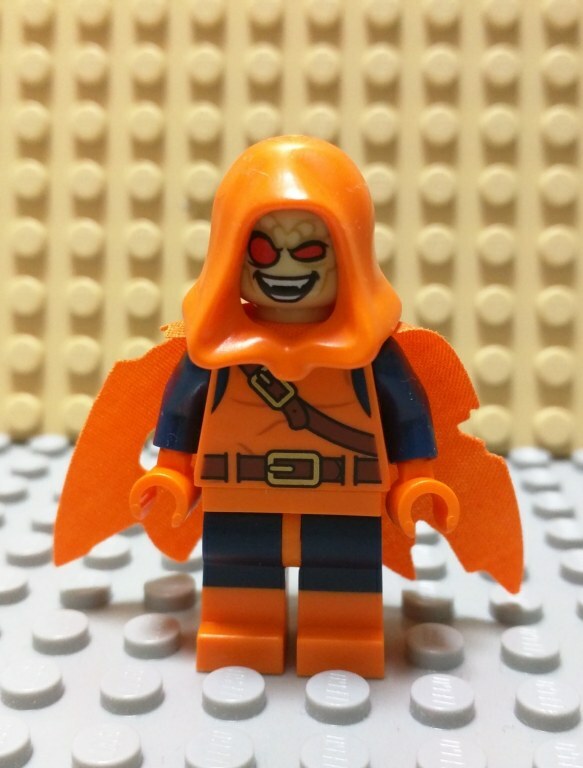 The other reason is that, while most people were attracted to this set for the Ghost Rider, and despite the fact that he never was a major villain, the main draw for me was the Hobgoblin minifigure. For some reason, during the (relatively) short time-span during which I read Spider-man, he was my favorite villain of the series. So here we are, with a set I liked, except for a few details. I think he’s pretty “good-looking”, isn’t he? His glider is a bit bulky, but there must be a way to make it smaller. I’ll have to look in that. 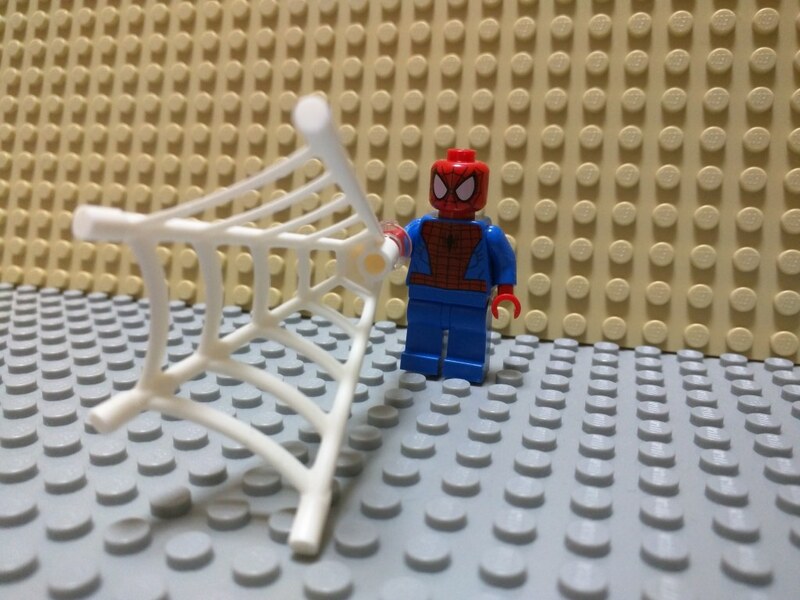 The Spider-man minifigure is the one that has been used in most Spider-man sets. They did introduce an updated version in another set (the one with the Sand-man), I’m not sure why that version is unique to that set. I like the new web. 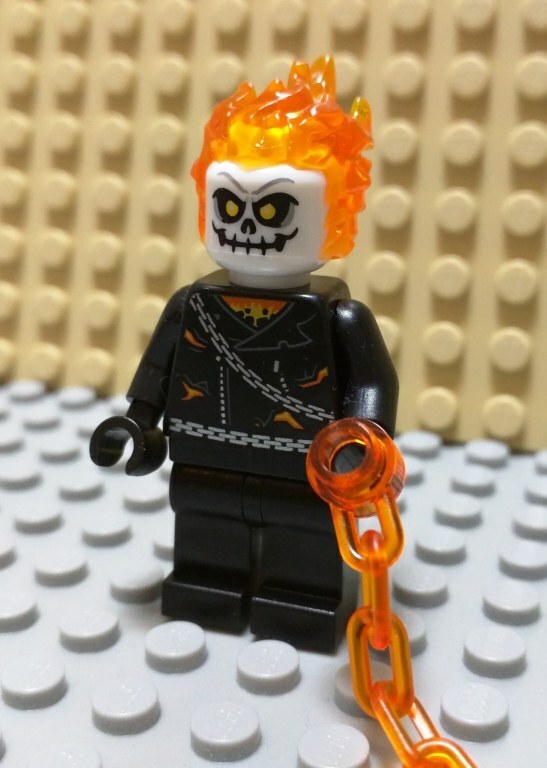 The Ghost Rider minifigure is also pretty awesome. The fire on the head is much better than I was expecting. For some reason it’s glued on the head. I wonder why. I read somewhere that it may be because it’d be relatively fragile otherwise (the “side burns” are very thin). It could also be because Lego wants to keep it clean and don’t want us to set other minifigure’s heads on fire? Hmmm… I doubt it. 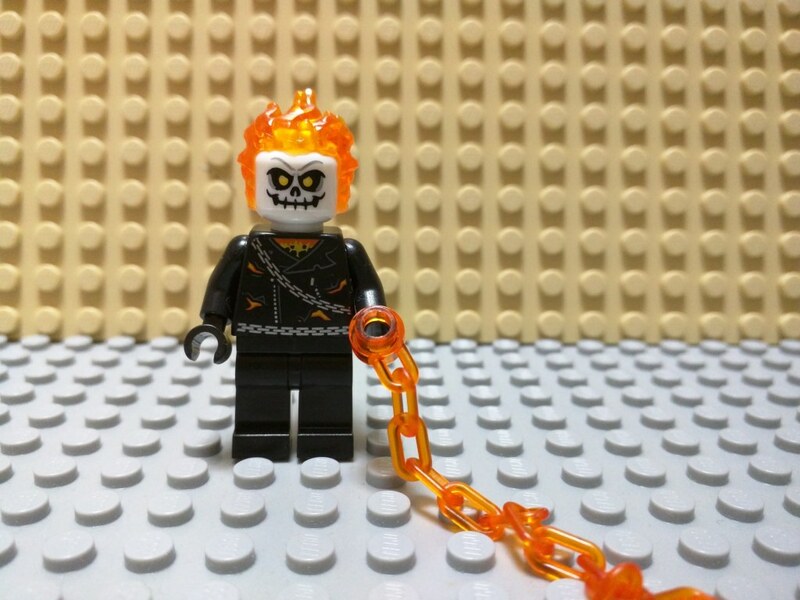 My only disappointment with this set is the Ghost Rider’s motorbike. While it looks OK on pictures, I find it too big, too strangely shaped. The red parts that attach the flames really look out of place. 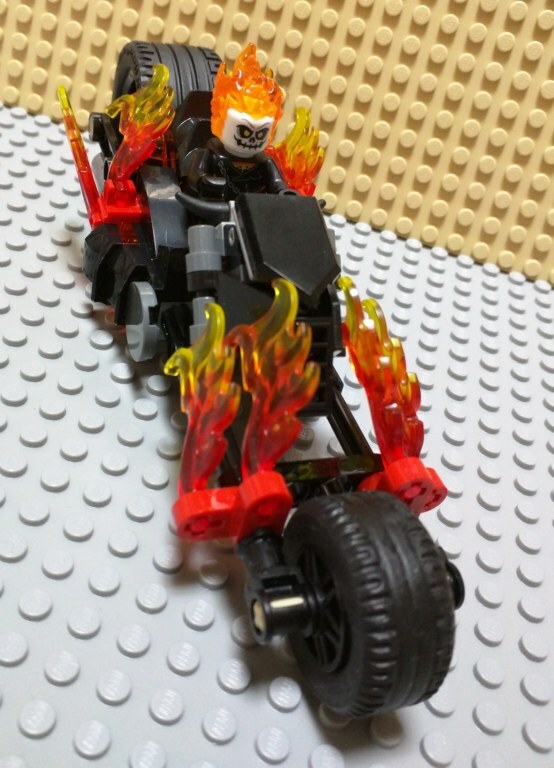 And as for the flames, themselves, they’re not optional, if you remove them, the bike really looks incomplete, as if there were some missing parts. And finally, while I don’t plan on playing with it (but I may give it to my son when he’s old enough for it), he doesn’t seem too sturdy at all to do that, a few parts come off too easily if you don’t handle it too delicately. Now, the real good surprise of this set is something I usually don’t pay attention to when I buy such a set, and it’s the small “background” elements. I really really love this tiny New York street corner. 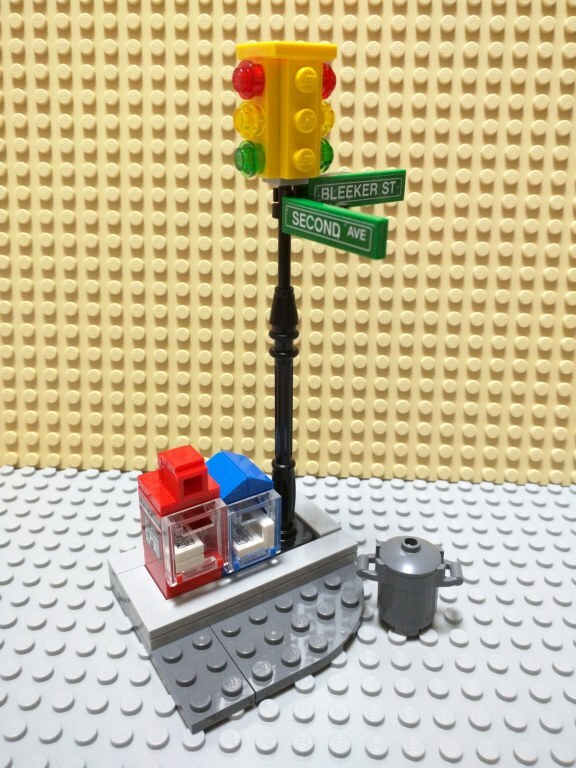 In just a few dozens of bricks, you know you’re in New York, and you get a bunch of cute little easter eggs, be it the street signs, Second Avenue and a mispelled “Bleeker Street“, or the newspaper boxes that so remind me of the US. And they’re not random newspaper either, but the infamous Daily Bugle as well as Frontline, the two iconic New York papers in Spider-man. There are copies of the latest issues in the boxes, and even some trash in the trashcan. 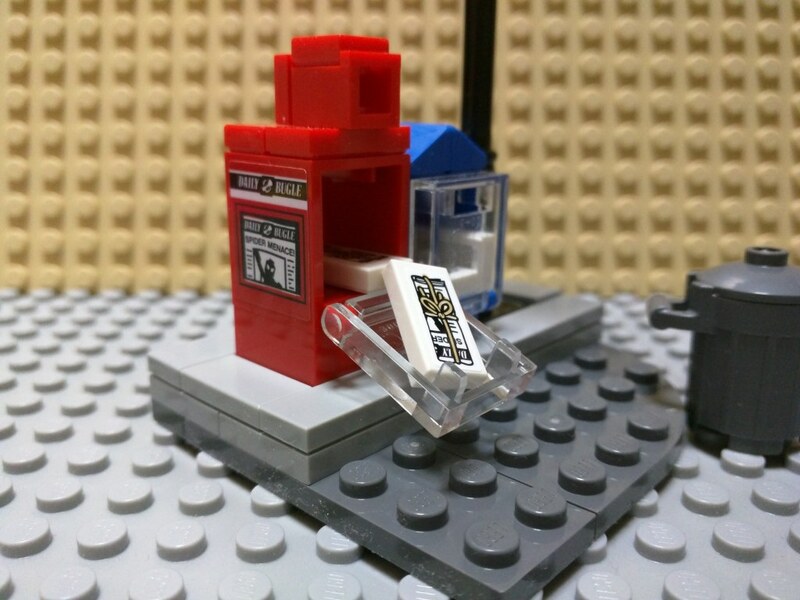 I don’t know about you, but while I mostly collect Lego for the minifigures, those are the kinds of details that made me love some sets. In other words, if you like any of those three characters and haven’t bought the set yet, may I advise you to do so, it’s really worth it, especially for a cheap set like this. And depending on where you live, it may even get cheaper soon as it’s getting older (I really envy Lego fans living in the US where older Lego sets can go on sale for very cheap, no such luck here in Japan, where prices stay relatively steady until a set becomes rare and prices skyrocket).